After several months of planning and development, Obsidian Fleet is proud to unveil the successor to our Integrated Fleet Management System, or IFS for short. 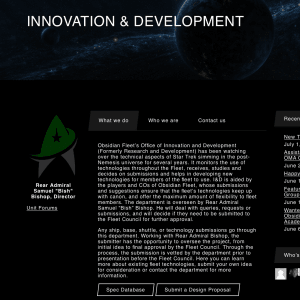 IFS has been used across the Star Trek PBeM genre since we released it as open source in 2001. This is IFS2. The first thing you’ll notice is the modern look and feel. We’ve transitioned to an entirely new Content Management System powered by WordPress and tools (you can see more info on the Credits Page) and worked on developing a new theme that’s visually distinct and also responsive so it’ll work across mobile phones, tablets and desktops equally well. 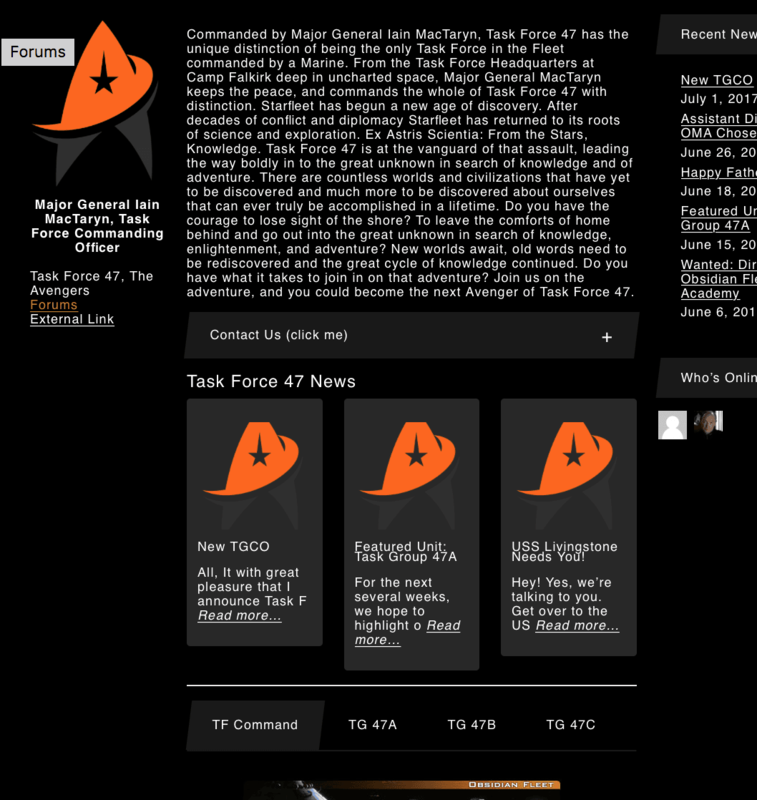 We’ve also integrated the subsites from obsidianfleet.net into a series of “landing pages” for each Task Force and Department so it truly is one site for the fleet. Each TF page has space for some of the recent TF News and the ship listings so it’s all in one place. We’ve also taken on board the recent feedback on forum use and the mailing lists by combining them into one dual-purpose system. 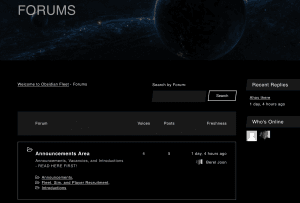 The fleet forums will now not only act as a discussion board, but they’ll also replace the current Yahoo!Groups portals for the Fleet Council, CO list and Task Force mailing lists. The same group functionality will also provide a platform for community engagement in the future. For players who wish to continue to use email to read/reply to topics you’ll have the option to do so from your settings and be able to submit emails straight to the forums. 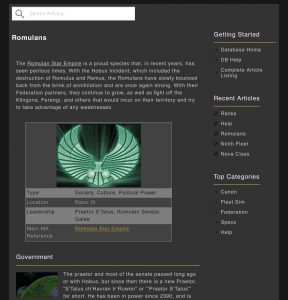 Going further, we’ve also made it easier for players to reference and contribute to the Fleet Database by replacing the Wiki with an integrated knowledgebase. If you wish to contribute, you’ll need approval and to join the Contributors group (Community>Groups) in order to gain access. As with most social hubs online, you can leave comments on news stories and we’re hoping to roll this out to other areas of the system as they get developed. We’ve streamlined the news submission process to improve the time between production and publication and added the ability for the news articles to be shared on Social Media. Anything flagged as Headline News will automatically be shared to the Fleets Facebook and Twitter feeds. If you wish to see all the news, just click on the News page at the top to see everything going on across the fleet. That’s pretty much it for this release. However we’re not stopping there. Our next release, codenamed Kirk, will see the Academy launch an online learning platform for players to enrol automatically on courses. The Academy page contains a Course Directory for you to be able to look at and choose the course you wish to study on and you’ll be able to earn a certificate as proof of your achievement. Soon after, we’ll be launching the Character Directory, allowing players to add their characters to the site so you can show them off in your new Player Profile page. We’ll be adding Sims to this in the very near future and adding the functionality for you to assign your characters to sims. CO’s will have a page on the site for their sim that they’ll be able to manage, add news, mission updates, etc. to so any prospective player can see why they should join your sim. Other IFS functionality like monthly reporting, awards, etc. will arrive in due course. This is a huge stepchange in our systems for OF, so we’ve provided you with some help. There’s a help request form available for you, tutorial videos, and guides. There’s also a dedicated forum for IFS2 help and you can ask on Discord in the IFS2-help channel. I’d like to thank the developers of IFS1 who built a system that’s stood the test of time. I’d also like to thank Admiral Sharr for his support in getting this new system running. Extra special credit goes to RAdm Joon for basically building the bits I didn’t do. I’d also like to thank the Fleet Council for their work this last month in porting over content and bug-testing the site. It’s something Major General MacTaryn managed to do a lot. Last but not least, I’d like to thank each and every player who’s engaged about what features they’d like to see and just been there to help us drive this forward. We wouldn’t have been able to do this without your input. Welcome to IFS2.1 – or as we call this version, Pike.